Ever since his youth, Robert Leanza Williams Jr. dreamed of becoming an attorney – but that dream seemed to slip out of reach early. The son of a hardworking single mother, he grew up on the rough streets of Miami. He remembers vividly the times when the family couldn’t afford to keep the lights on, and had to cook dinner on a hibachi. His brother was shot. There were the usual temptations, too. Do well in school, and you could end up teased. “I hated high school. I set a record for the number of days missed,” said Leanza, who dropped out. And yet, on Dec. 5, he spoke to participants in SUNY Broome’s Lunch with the Law program dressed in a sharp suit and tie – about to leave for his job as a criminal defense attorney in private practice. During a Skype session, he spoke about the setting goals – and pushing on step by step, even when those goals seem years away. Executive Vice President and Chief Academic Officer Francis Battisti addresses students during the Dec. 5 Lunch with the Law program. Organized by SUNY Broome student Talik Farmer and the college’s Men of Excellence program, Lunch with the Law brings together local law enforcement professionals with young men of color from SUNY Broome, Union-Endicott High School and Jennie F. Snapp Middle School. They sit down together, eat and talk, with the goal of building relationships and eliminating divisions. “This is a great opportunity for you to get to know our law enforcement officers as people,” SUNY Broome President Kevin E. Drumm said to students, noting that criminal justice was among the most popular college majors in the country. The program was established by Vice President for Student Development and Chief Diversity Officer Carol Ross. She developed the idea after learning about student Marquies Orr’s project in 2017, Meet the Person Behind the Badge, which sought to break down divisions between law enforcement and the communities they serve. The first Lunch with the Law session connected students with cadets from the law enforcement academy – some of whom had never interacted with a person of color before, Dr. Ross noted. SUNY Broome President Kevin E. Drumm addresses students during the Dec. 5 Lunch with the Law program. 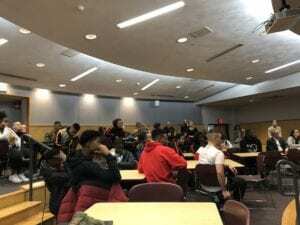 In addition to students, the Dec. 5 session – in which the Georgia-based Leanza connected with the audience through video-conferencing – also drew Broome County Sheriff David Harder and Sgt. Sammy Davis, who also teaches at SUNY Broome. Leanza, it turns out, was one of Dr. Ross’ students at Florida State University. Although a high school dropout, Leanza enlisted in the U.S. Marines – “I really wanted to be the best,” he explained – and the military encouraged him to earn his high school diploma. He gave the Marines his best, was promoted several times and eventually selected for the officers’ program, which gave him the opportunity to attend college. Vice President for Student Development and Chief Diversity Officer Carol Ross talks to students during the Dec. 5 Lunch with the Law program. His path, however, took multiple detours. At Florida State, he played football and joined a fraternity, but didn’t get the grades he needed to go on to law school. He decided to move to Atlanta and manage rap groups. Then, he followed his brother’s footsteps to become a firefighter in Fort Lauderdale – a great job, “but it wasn’t my dream.” He repeatedly took the Law School Admission Test, but didn’t get the scores he needed. His break came rather haphazardly. Working as a bouncer at a Miami nightclub, he chatted with some patrons who were law students, who connected him with an LSAT tutor. Eventually he passed the exam and attended St. Thomas University School of Law in Miami. He worked his way up, becoming a prosecutor in Miami-Dade County and later establishing his own practice in criminal defense and personal injury. He knows a good deal about making mistakes and how not to make them worse – both from his law career and his own life. Students listen to attorney Robert Leanza Williams Jr. speak via video-conferencing at the Dec. 5 Lunch with the Law event. To keep on track, students need to focus on a dream, no matter how farfetched it may initially seem, and a viable plan B. “If you’re pushing for your goal, something will happen. A break will come for you,” he said.